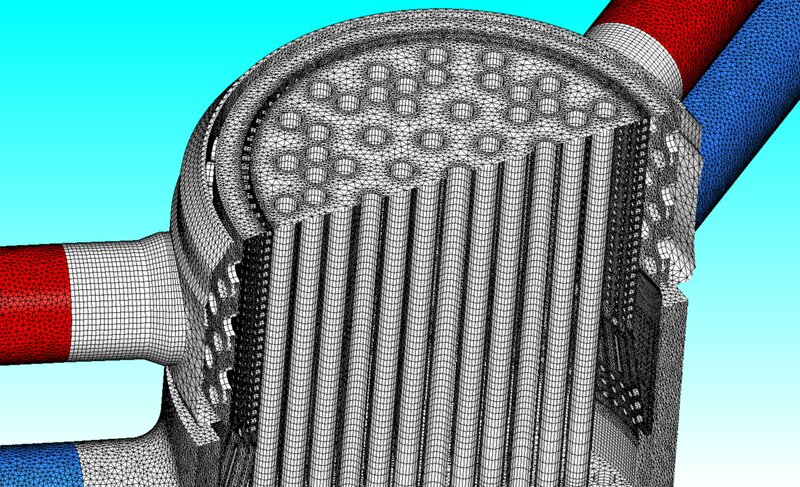 Pointwise loves meshes and our Meshy Award is a way to celebrate those meshes that combine engineering insight with artistic flair. At the Pointwise User Group Meeting 2016, we’ll be recognizing one such mesh. Will it be yours? The only way to find out is to enter your mesh by August 5th. It might be a good idea to browse this gallery of prior Meshy Award winners so you know how high the bar has been set. 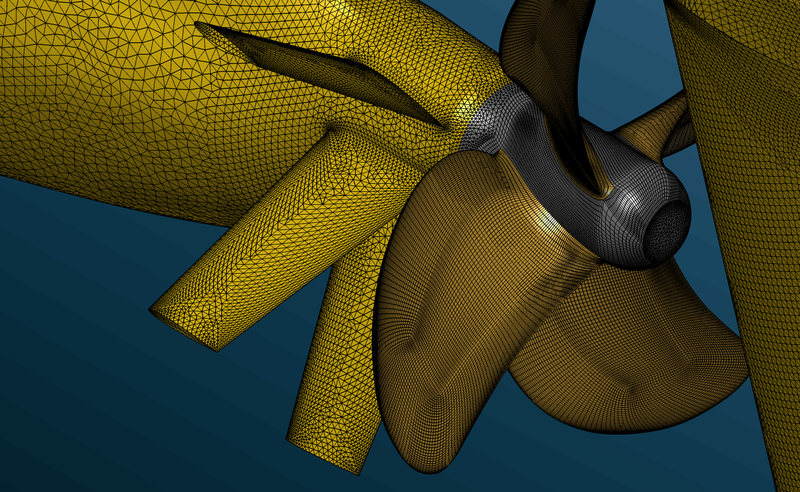 The problem Prof. Bensow studied using this grid concerns cavitation on a ship propeller and how it is affected by the installation upstream of energy efficiency improving stator blades that change the propeller inflow. The propeller is rotating in the simulation. Near blade mesh resolution and quality are important in order to capture details of the cavitating flow. Mesh requirements are achieved using a structured mesh on the blade, which is then extruded into a hex boundary layer mesh. At the same time, the wake from the stator blades needs to be propagated and not smeared by numerical diffusion, so a grid refinement is achieved using Pointwise’s T-Rex (anisotropic tetrahedral extrusion) technique and baffle surfaces in this region. This grid was constructed for CFD performance studies of a Low Head Safety Injection (LHSI) pump for nuclear power plants. The grid was constructed in seven parts comprising the inlet, impeller, leakage flow paths, diffuser, collector, and discharge flow paths. A variety of meshing strategies were used in the various parts including all hex, hybrid tet-prism, and T-REX mesh topologies. 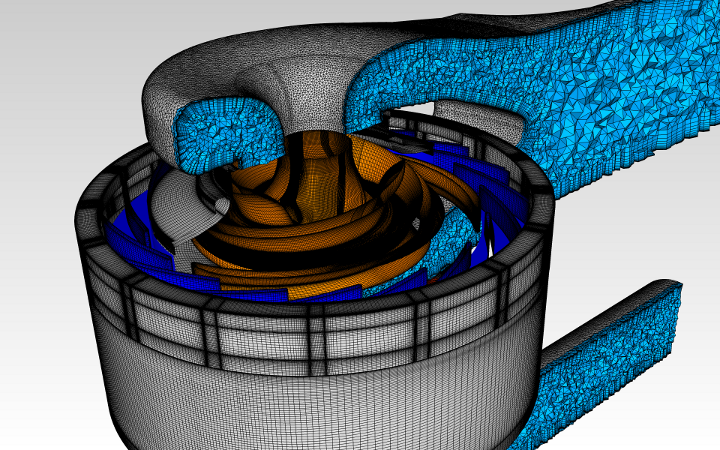 All seven parts were run coupled together using the CRUNCH CFD flow solver to predict the performance of the pump system for a variety of flow conditions. The model represents the reactor pressure vessel (RPV) with all its 4 primary loops and components like pipes , steam generators and pumps of a Russian VVER1000 nuclear power plant. While the components of the primary loops (steam generators and pumps) are not resolved in detail and the impact on energy and momentum conservation is considered by porous media models in terms of volumetric sources and sinks , the internals of the pressure vessel – with exception of the nuclear fuel pins- are resolved in all details. The overall hybrid mesh contains about 35 000 000 cells with scale resolutions of 150 mm inside the steam generators down to 1 mm inside the RPV. The model was used for the recalculation of plant tests like a pump tripping and the isolation of a loop from its steam generator (at a low nuclear power level) in contest with a VVER1000 benchmark initiated by OECD. Don’t delay. 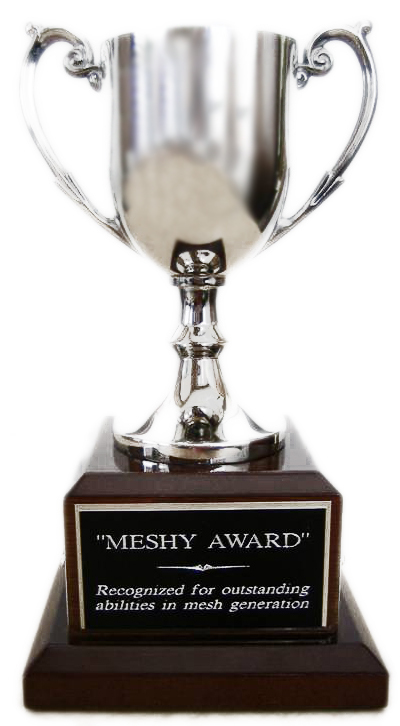 Enter your mesh for The Meshy Award today. This entry was posted in Applications, Events, News and tagged Meshy Award, Pointwise, Pointwise User Group Meeting. Bookmark the permalink.